This article series offers an overview of local search engine optimization techniques for dentists and businesses offering local services. If you have any questions or need assistance, don’t hesitate to reach out to us. We’ll be happy to review your dental website and search engine rankings in a free strategy session. 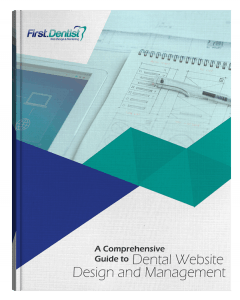 Your dental website is a crucial part of your local marketing efforts. It serves not only as your introduction to new patients, it also determines your success in becoming visible on search engines like Google and Bing. Almost all new patients will visit your website to get information and assess your practice. Make sure your dental practice can be found when and where they are looking. Your search engine optimization and website development efforts will determine whether they find you and become a new patient. In this article we’ll discuss the essential factors for optimizing your practice website for local search. We’ll also cover the future of search engine optimization and new search trends like voice search. How important is your practice website for SEO? As we discuss local SEO ranking factors in this article series, it’s important to understand that your website is not the most important factor in ranking in Google’s search engines. There are other factors that we discuss in our Local Search for Dentists article that are more important. Search engine focused website development is still extremely important because it’s the one factor you have complete control over, and certain types of mistakes will dramatically damage your rankings. There are even several issues that can prevent your site from ranking entirely. In the over 20 years we’ve been doing SEO, we’ve seen a lot of sites that can’t rank because they were not built properly or open to search engine crawlers. 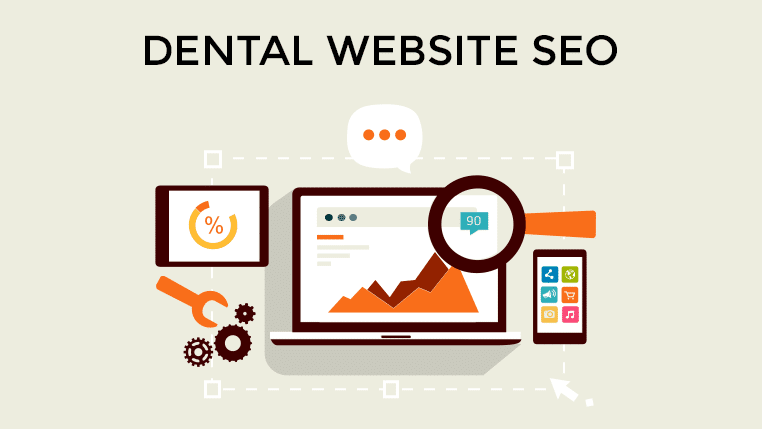 Many dental practice websites are built by web designers who do not specialize in search engine optimization best practices; as a result, those websites often struggle to gain visibility. First Dentist specializes in SEO and website design for the dental industry, and our CEO Ross Dunn has been an SEO industry leader since 1997. One of the biggest changes to the search landscape in recent years is the rise of voice and mobile search. This trend has increased the importance of proper technical or structured data markup for websites. Google builds a knowledge graph for your business and this structured data forms the basis of voice and other location-based searches. 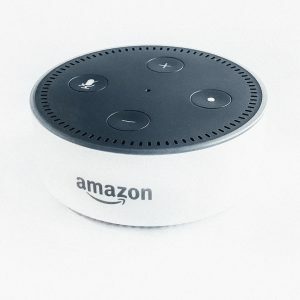 In the future, you may not even think of your website as a place your customers visit on their desktop computers, but instead as a source of data information for voice searches from consumer devices like Google Home, Alexa, and Siri. 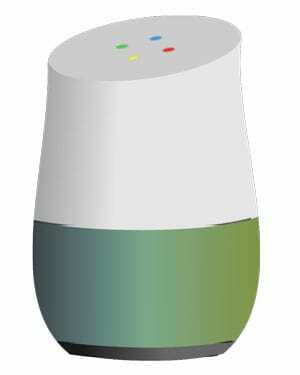 This fundamental change is still a ways off but it won’t be long before voice assistants are a major source of website traffic and new patients for dental practices. Ten years ago no one could predict the search dominance of smartphones. Voice search is a similar trend. As a search marketing and web development company, First Dentist is planning your website and digital marketing for current and future technology trends. Read on to learn about some of the important elements of structured data markup. Look at the number of results for your website. If that number matches the approximate number of pages on your website, the search engines have it indexed properly. If pages are missing there may be an issue with your website. How do search engines view your practice website? Use the website http://www.browseo.net to see how search engines view your website. Is there an appropriate amount of text for the search engines to understand your site? Do all images have alt attributes (description tags)? Is there a proper heading (H1, H2, H3) structure? Browseo breaks down your site to show you how a search engine might read and understand that data on your site. If you don’t see much on Browseo then you might have a problem. Website architecture is the structure of your website’s information and encompasses navigation, links, and organization of the content. New patients need to be able to easily understand how to find the information they are looking for or they will quickly get frustrated and leave the site. From our experience developing hundreds of dentist websites, we’ve identified and created the optimal structure and paths for organizing the information new patients are seeking. The most important new patient task for most practices is to make it easy to book an appointment or contact your office. Your goals include having new patients contact your office or phone you to make an appointment. New patients’ goals include finding out who the dentist is and what the practice is like. They are also searching for information about insurance, services and anything that makes the practice distinct. Given the intimate medical nature of dentistry, they are also looking for someone they can trust and feel comfortable with. Provide new patients with this information before they will contact you. Let’s look at how a First Dentist website helps the practice and website visitor achieve these goals and increases the chances of higher rankings using just one of our key techniques: great site architecture. Google rewards sites that have a complete list of their services and relevant information about the dental practice. Google does not like websites with only a few pages, duplicate content, or thin content. When we develop your site we will work with you to create unique and well-written content that will impress new patients and assist you with your SEO efforts. Professional photography and videos give new patients the information they are looking for in a visual format. Google likes this type of user experience. Google may also use site engagement signals like dwell time to influence rankings. Integrate great photography and video into your new website to see an increase in new patients. The planning that goes into great site architecture and content is not limited to the items above, but they are notable points. You can feel confident leaving further technical aspects to our experienced team. A First Dentist designed site is very carefully planned for excellent user experience and the greatest possibility of high search results. Local SEO industry experts consider reviews and testimonials to be a trust signal for the search engines, and definitely influence rankings. In local SEO industry services, reviews are 13% of the local maps pack ranking factors. Displaying reviews and testimonials on your site also helps with new patient trust. After restaurants and hotels, the medical industry is the second most popular review category. 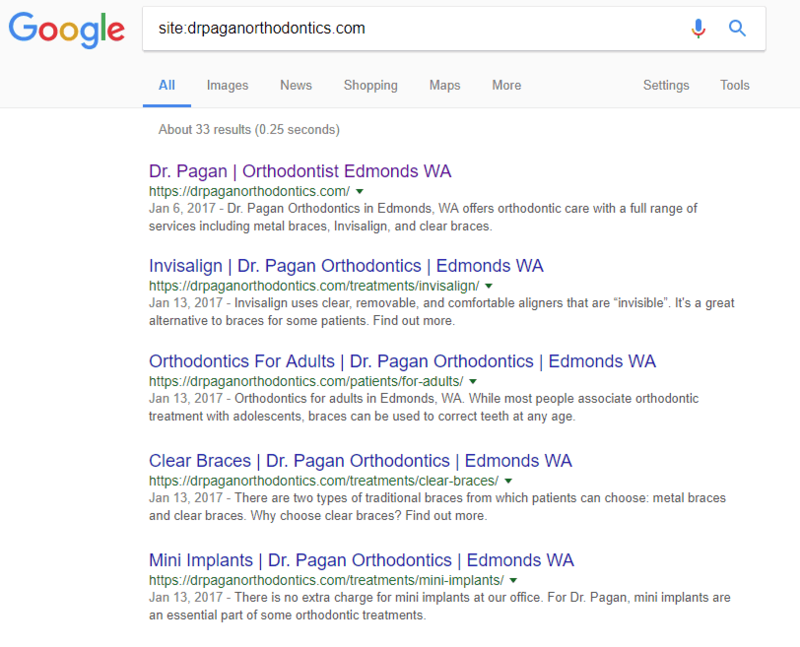 We’ve noticed that a popular search term is now best dentist and Google often shows the practices with the highest rankings. We offer several solutions to help solicit reviews and display them on your website. You can see below that Pediatric Dental Associates of Randolph ranks #1 in organic and local maps for the search term best pediatric dentist. This is because they have excellent reviews. They use Proven Local (First Dentist review software) and encourage patients to leave reviews on Facebook and Yelp. Make sure you have a process to carefully encourage patients to leave reviews. You’ll be focused on acquiring these reviews for as long as you own practice. Your practice search results and potentially the value of your practice is dependent on building a great online reputation. Google reviews are among the best reviews to encourage because they have an undeniable impact on rankings and new patients. An important issue for most dentists is negative reviews. Because you just can’t make everyone happy, it is inevitable that every practice will get some negative reviews over time. How you respond to negative reviews is a critical business practice. Read our blog post,.How to Handle Negative Customer Reviews for Dental Practices to understand how to deal with negative reviews. Your practice success could depend on it! First Dentist adds a few important pieces of information to your website to help it rank. We include the practice address, hours of operation, and contact information on every page in the footer and header. 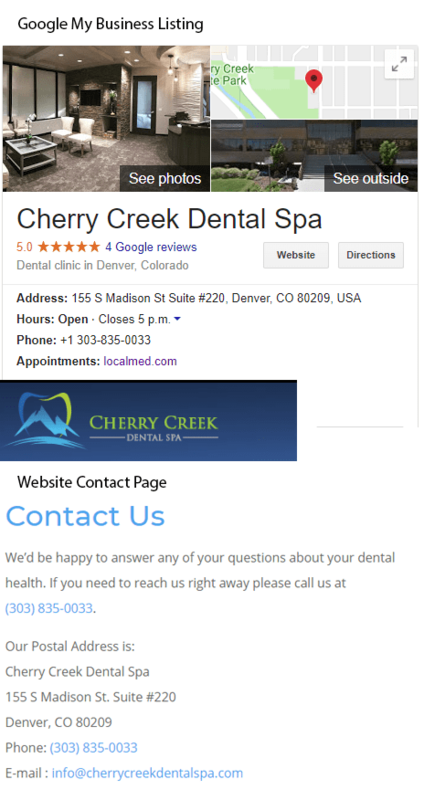 Here’s an example of a First Dentist website with the kind of well organized contact information Google likes. Make sure your phone number is clickable. The majority of your new patient inquiries will come from a mobile device and will result in a phone call. It’s essential to make sure that your phone number and directions to your practice are easy to find. We include them in mobile menu’s and offer a direct link from the homepage. It’s important to include a map because data shows 86% of people check the the business location on Google Maps before visiting. You can consider it your digital business card for the search engines. Google uses NAP to verify that your practice location is legitimate, and cross references this information across multiple data sources on the internet. It’s important to make sure that your data across all sources online is accurate. Try googling your practice and find out what Google and other websites think your street address is. Instances where the Name, Address, Phone Number data appear across the internet are referred to as local citations. You can check your local citations at https://moz.com/local/search to see if there are any issues with your practice address on your website and your online citations. Incorrect local data is one of the most common problems local businesses experience. Your search results depend upon getting these consistent across the web, especially if you’ve ever moved offices or changed a business name or phone number. Your practice contact page is important to both Google and new patients. Make it easy for them to contact you, and make sure that you are using consistent Name, Address, and Phone Number (NAP) data. This information needs to match your Schema data, which we discuss later in the article. Your Google My Business (GMB) page is one of your most important marketing assets. It acts like a central hub for your search listings on Google. Make sure your practice information on GMB is up to date and matches your NAP data on your website. Specifically, your contact page and footer address should always match all the information you’ve used to set up your Google My Business page. Read our blog post on Google My Business for Dentists to understand how to properly set up this important piece of the Local SEO puzzle. A common issue with dental practices is the use of call tracking numbers. This is a specialized area of SEO. Do not use call tracking numbers unless you know how to set them up so they don’t damage your search engine optimization efforts. Google Maps are a must-have feature on your contact page. The maps page allows users to easily find your practice and acts as a navigation tool to help them find your practice. Google may also consider how many people use your maps directions as a ranking factor. Consider adding driving directions from nearby neighborhoods on your contact page. It adds text that Google may value. You’ll want to create a unique page for each location with a Google map, address and the other information we discussed above. Make sure they contain unique content and text. Link to the contact page for each location in the footer and primary navigation as well. All of the major search engine crawlers read schema and technical markup data. Schema was developed so that all major search engines could understand data about a website in a common language. 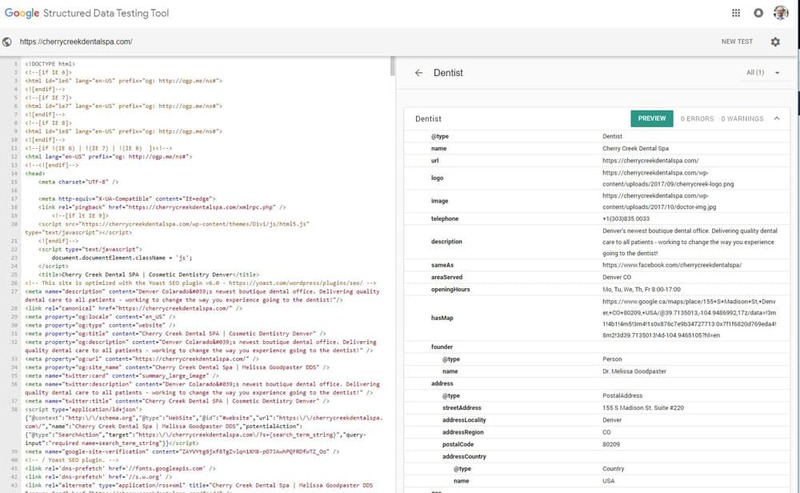 First Dentist uses JSON-LD because it is Google’s preferred type of structured data. Structured data presents data about your website to the search engines in a way that is easy for them to read and interpret. Local schema helps search engines understand that your practice website is a local business, not an international brand. Search engines are building extensive knowledge graphs that they use to power a variety of search technologies. Google My Business and Google knowledge panels provide information to Google Assistant, Google Voice search, and mobile search results. Knowledge graphs and structured data also allow Alexa and Siri voice searches to provide answers for Apple and Alexa devices. If your website isn’t properly marked up with structured data, you may miss out on showing up in these types of searches. As trends like voice search (Google Home, Alexa and Apple HomePod, Siri, Ok Google) and personal assistants become more prevalent, developing your website with the proper technical code will offer benefits in the future. When your website is properly developed and marked up, you’ll be more likely to show up in these specialized searches that feature these types of technical microdata from your site. Google knowledge panel, voice search results and reviews all return this information from user searches. Make it easy for Google and other search engines to build your profile and knowledge graph. You’ll show up a lot more in searches if you do. Working with a company like First Dentist ensures this technology is integrated into your practice website. We’ve been building websites and practicing SEO since 1997. We know what works, and we know how to prepare your website for what’s coming. You can find more information about dentist schema at http://schema.org/Dentist. All search engines, and especially Google, have prioritized mobile user experiences. This means that if your website is not optimized to display properly on mobile devices, you may not rank as well in the mobile search engine results. Mobile best practices include proper text size, properly optimized calls to actions and buttons, easy-to-use menus and navigation, pages that are designed to load quickly on mobile devices, website viewports that resize according to device and screen type, and images that are designed to load quickly. Optimized mobile menu with calls to action, address, contact info, and search. A user-friendly homepage that makes an impact. 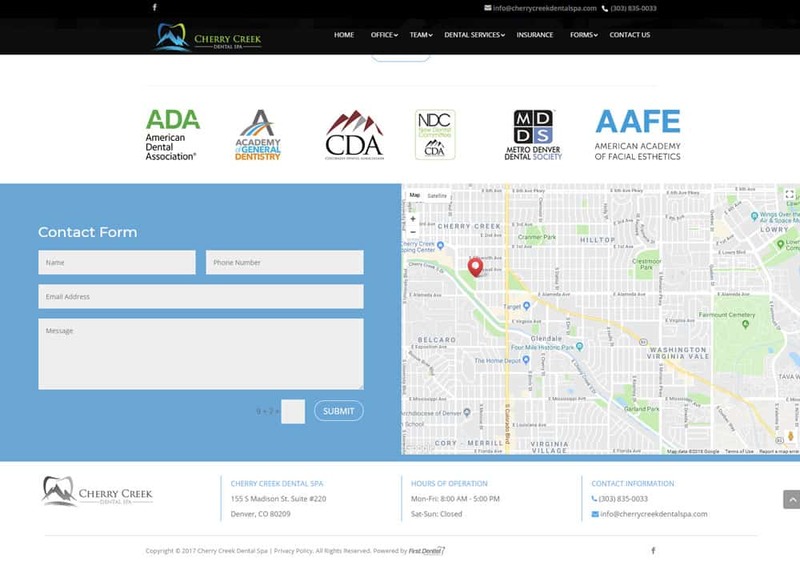 In this example from a First Dentist website, there is an easy to click phone number at the top, an easy to click email link, a call to action to request an appointment, and visually appealing header. The fonts are all properly sized and easy to read. Google’s Mobile-Friendly Test and Page Speed Insights Tool will show you how well your site is optimized for speed and mobile user experience, and will also provide suggestions for improving your site. GTMetrix is an advanced tool that can offer additional insight into site performance. What keywords should dentists use on their websites? You want to use the highest volume search terms that are used to describe your dental services. 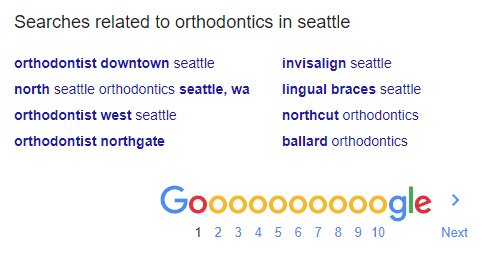 For example, a Seattle orthodontist would be targeting keywords like orthodontist Seattle, braces Seattle, or Invisalign Seattle. There are some specific location-based searches that people use; however, most people assume Google will return results for their local area. You do want to use the language that searchers would use, not dentists. For example, make sure you aren’t just targeting orthodontist, you need to include specific terms such as braces and Invisalign. Check the bottom of the search page to see keyword phrases Google thinks are related to the search term. For orthodontists, there are often neighborhood-specific locations or service specialties like Invisalign. Google is very good at understanding where your practice is located and local search is moving towards highly customized search results based on the location of the searcher. For that reason, we recommend dentists optimize for their city and their neighborhoods within five miles of their practice. For example, a Los Angeles dentist might want to optimize for Beverly Hills if they are close to that neighborhood. Don’t try to rank for cities or neighborhoods that you aren’t close to; Google will likely not rank you and could even penalize you. You can use Google AdWords pay-per-click advertising to target distant neighborhoods that you feel you could still draw patients from. Blogging can be an effective way to add local content to your website and to attract links. In this Local SEO series, we’ve discussed different ranking factors and links are considered the most important ranking factor by many industry experts. You can blog about local news and events and even use your blog to support local charities and sports teams. Blogging can offer a small boost for practices but there are other important types of content that should be your focus first. The problem with blogs for dental practice websites is that your audience probably won’t spend much time reading your blog. So your time may be better spent on writing authoritative content about the most important services you offer. If you offer a service like Invisalign or dental implants, you can write an article that answers all the questions your new patients have about the service. This simple task will help you rank for that service in your local area. Authoritative content can also attract links. Several of our clients have gained links to their websites from online articles and even other dentists. 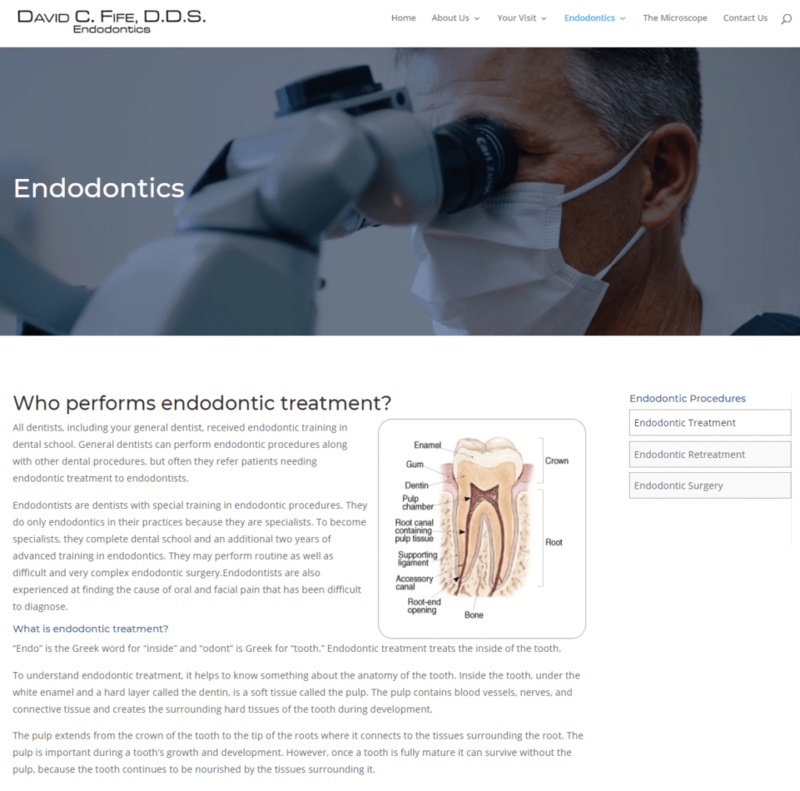 A great example of authoritative content is on Dr. Fife’s website about endodontics. The combination of blogging and authoritative content can have a powerful impact on your rankings. Make sure all of your content is unique. We’ve seen lots of dentists copy and paste text from their dental association or equipment manufacturers onto their website. Google may penalize sites that have low quality or duplicate content. Publishgin this type of content will not help your local SEO efforts. We’ve also seen dentists who want to build a separate site for a service like dental implants in their location. We recommend, and most industry experts agree, building one authoritative website for your practice brand that may include several locations or specialty services. Splitting your efforts usually results in weaker search engine rankings and will certainly increase expenses. This is a good example of how a First Dentist website is optimized by using keywords in the title tags. Do not overuse these keywords because Google can penalize your website if it’s obvious spam or abuse of keywords. Always write for the website visitor, not for Google. Google can tell how user-friendly the text on a page is so don’t try to trick them. Climbing to the top of the search engines isn’t an easy task but it is critical for your practice if you want to attract new patients online. It all starts with your website. If you follow the advice here you’ll be sure to create the best foundation possible. 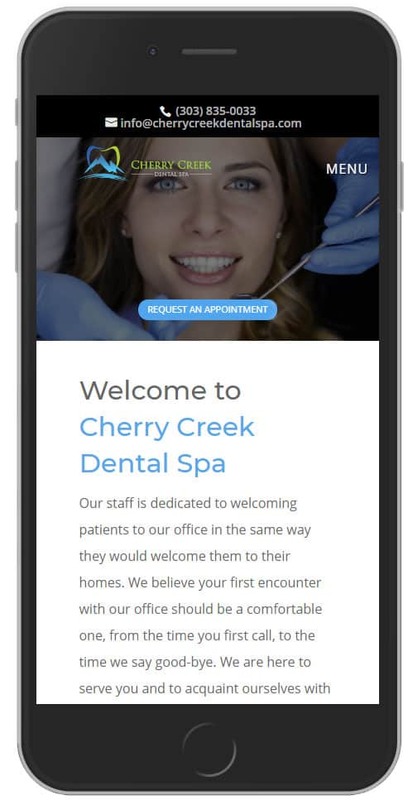 First Dentist specializes in building search engine optimized websites. We also offer SEO services for practices with existing websites. Please contact us for a free consultation where we’ll examine your local search market in depth and provide you with a thorough analysis and strategy to attract new patients online.